I have been doing some stuff with keyboards this week. Almost 5 months ago I purchased a Logitech G15 gaming keyboard. You can read my review here. This was a very interesting idea, with some integrated features, such as an LCD and additional "macro" keys, which gave me high hopes for it. I purchased the board intending to use the macro features in World of Warcraft. While I was pretty happy with it while I've had it, unfortunately the fancy bells and whistles did not make up for the fact that the basic feature of the keyboard - the key switches themselves - were the same cheap garbage you can find in a five dollar keyboard model. 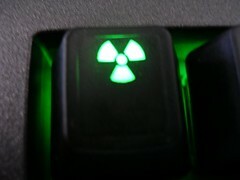 Despite looking nice out of the box, the paint rubbed off of frequently used keys such as "alt", "h", and the spacebar. The keys themselves now audibly squeak when I press them and some of them require more pressure than before. I would like to say I collect keyboards. The truth is, I destroy keyboards. Every 6 months or so my keyboard starts to crap out, either losing multiple keys entirely (as with the Logitech DiNovo) or simply becoming too annoying to actually type with due to some built-in flaw (as with the Eluminex). 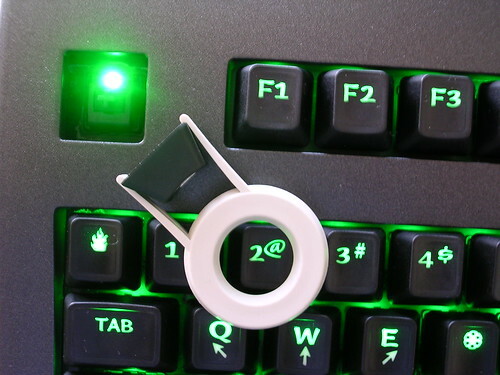 Originally I thought that my normal rate of destroying keyboards was highly abnormal; however, while reading an interesting review of a keyboard, I discovered that the normal rating of a rubber-dome key switch is about 1 million cycles. If you do some arithmetic on those statistics, it turns out that such a keyboard would only be rated (optimistically) at 220 12-hour days of 80wpm typing. I generally type at 120wpm, although not entirely without errors, so the MTBF for a keyboard for me would average around 150 days, or 5 months. As I was saying, almost 5 months ago I purchased a keyboard. It doesn't work quite as well now as it did then. I am lucky to have learned to type as one would learn to play piano: wrists straight, elevated. My form is certainly not perfect, but I follow this advice often enough that while it's good for my wrists, it only helps to accelerate the rate that I can annihilate normal keyboards. Speaking of piano, I learned this weekend that a professional piano player might spend 1/3 as much time with their fingers touching their keys as I do mine, but they might easily spend $150,000 on such an instrument - and in fact, have more than one. Bolstered by this, and by recent successes at Divmod, I decided to celebrate by buying not one, but two keyboards, which I could actually add to a collection rather than tossing out as soon as my various projects have finished turning them into pulp. In contrast to my previous review, both of these keyboards are bog-standard PC 104-key keyboards with only one special feature each: the Legend is backlit, and the EnduraPro has the integrated Trackpoint. There are no volume knobs, no "Internet Buttons", no integrated USB hubs, toggle switches or programmable keys. Also, there are no 1/2¢ rubber dome switches which are going to wear out after another 5 months or feel like crap after 3. So, on to the main event: keyboard feel. How do these keyboards compare? Either one is easily better than any other keyboard I've used in the last 5 years, with the possible exception of the Tactile Pro. 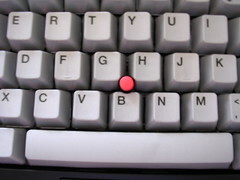 Unfortunately, while the Tactile Pro had high-quality key switches, used an extremely cheap and shoddy key-matrix chip that made it drop keystrokes for people who type quickly. One of the first things that impressed me about the folks at Déck was that their ad-copy frequently mentions that you can type at 240 characters per second on their keyboards. "You cannot type this fast. Ever." 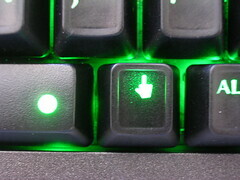 The Legend isn't quite so good: there is a definite "click" as your keys strike the bottom of the switch, however, the key activates about halfway down, not at the point of the click, so you end up doing more work and being slightly less sure of when the key has activated. However, the Legend did have some advantages. For one thing, although it's not quite as quiet as the mush-fest boards that we're all used to using, it is a reasonable volume. This is important to me, since I do type in pretty close proximity to someone every day. 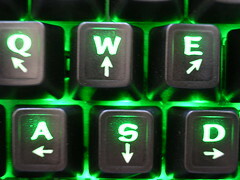 Also, I spend almost as much time looking at my keyboard as I do touching it. Although I see it out of the corner of my eye (I don't have to hunt and peck for keys, obviously) it is a fixture of my world and I'd prefer that it didn't look awful. Considering the extremely high quality of most of the other parts that went into this keyboard, it's a shame that a few details like this can ruin the overall effect. I particularly appreciated the icons they gave me for my F9 key. Doesn't this just scream, "Run Trial"? I also appreciate the inclusion of the key removal tool, because I'm sure I'm going to take it out when I need to clean this keyboard. 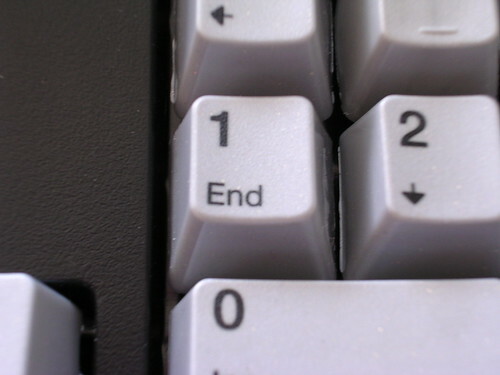 This was made particularly stark because when the EnduraPro arrived, its spacebar was non-functional. I sent a mail to their support staff, and got a very prompt call back from an apologetic fellow who offered to replace it immediately if that was necessary, but asked me first to just try a simple repair: remove the spacebar and put it back. While this was far from difficult, I ended up rummaging around for about 15 minutes with this support guy on the phone, looking for a screwdriver or something small enough I could jam under a key to pop it off. I couldn't really apply even pressure, and I was worried I would break the key. It came off just fine, but all I found was a ballpoint pen, and I ended up slightly scratching and drawing on the keys I removed, and wiping the ink off was another few minutes wasted. Replacing the keycaps on the Deck, by contrast, took about 5 minutes from start to finish, to replace about 15 keys. Luckily Déck's keys happen to be the same form factor as Unicomp's, so the key removal tool works on both keyboards :-). In summary, both of these keyboards are a joy to use, feel pleasant to type on, and are a refreshing break from the sea of mediocrity plaguing keyboard manufacture today. While I do wish there were a good wireless keyboard with high-quality switches, the absence of other crazy special features is almost a relief. These are the sort of thing that anyone who types full-time ought to consider purchasing. Obviously, most people will only need one or the other. If you care all about function and not about form, get the EnduraPro. It's the clear winner in the tactile battle, and the integrated pointer will save you a bunch of hand movement, especially if you only use the mouse occasionally. However, if you care about style, or you have to worry about working with someone else in the same space, or you like the idea of "escape" being a little picture of a skull on your keyboard, the Legend is probably the board for you. Since both of the latter conditions do apply to me, I will probably use the Déck as my primary keyboard. However, thanks to the magic of USB, I am leaving both plugged into my computer. If the mood seizes me, I can now always get some of that old-school Model M Clackety-Clack.